April 2, 2019 by Kristin2 Comments on Enter to Win: BUMBLEBEE | Giveaway Just In Time for Easter! An Action-Packed Retelling of the Classic Legend. The action-packed epic adventure Robin Hood arrives on Digital February 5 and on 4K Ultra HD™ Combo Pack (plus Blu-ray and Digital), Blu-ray™ Combo Pack (plus DVD and Digital), DVD, and On Demand February 19 from Lionsgate. Directed by BAFTA Award Winner Otto Bathurst (2014, Television Craft – Director – Fiction,“Peaky Blinders”), this rich story is brought to life for today’s audiences using stunning special effects, thrilling battle sequences, and mind-blowing fight choreography. Robin Hood stars Taron Egerton (Kingsman franchise, Sing, Upcoming: Rocketman), Jamie Foxx (Django Unchained, Law Abiding Citizen, Ray), Ben Mendelsohn (Rogue One: A Star Wars Story, The Dark Knight Rises, Ready Player One), Eve Hewson (Bridge of Spies, Blood Ties, Enough Said), and Jamie Dornan (Fifty Shades franchise, The Fall, Anthropoid). SYNOPSIS: Returning home from the Crusades, Robin of Loxley (Egerton) finds his country oppressed by the evil Sheriff of Nottingham (Mendelsohn). With the help of Moorish warrior Little John (Foxx), Robin transforms into the heroic outlaw Robin Hood, taking up arms to fight the sheriff and win the heart of his love, Maid Marian (Hewson). The Robin Hood special features include an in-depth, never-before-seen, 7-part documentary; multiple outtakes; and deleted scenes, all of which show what it took to put a new spin on everyone’s favorite hooded hero. Experience four times the resolution of full HD with the 4K Ultra HD Combo Pack, which includes Dolby Vision® HDR, bringing entertainment to life through ultravivid picture quality. When compared to a standard picture, Dolby Vision can deliver spectacular colors never before seen on-screen, highlights that are up to 40 times brighter, and blacks that are 10 times darker. The 4K Ultra HD Combo Pack also features new HDR10+ technology, making for an enhanced viewing experience on next generation displays by using dynamic tone mapping to reflect frame by frame variations in brightness, color, saturation, and contrast. Additionally, the 4K Ultra HD Combo Pack and Blu-ray feature Dolby Atmos® audio mixed specifically for the home, to place and move audio anywhere in the room, including overhead. The Robin Hood 4K Ultra HD Combo Pack, Blu-ray Combo Pack, and DVD will be available for the suggested retail price of $42.99, $39.99, and $29.95, respectively. This promotion will end Tuesday, February 26th at 12:00 PM (eastern time). Only one entry per person. No purchase necessary. U.S. residents are eligible to enter. Winners will be contacted via email. AccordingtoKristin.com and other promotional partners are not responsible for lost, stolen, or misdirected mail. Out with the Old– Sugar Plum makes sweeping changes to the palace décor. This promotion will end Friday, February 4th at 12:00 PM (eastern time). Only one entry per person. No purchase necessary. U.S. residents are eligible to enter. Winners will be contacted via email. AccordingtoKristin.com and other promotional partners are not responsible for lost, stolen, or misdirected mail. SYNOPSIS: Deep under the Arctic Ocean, American submarine Captain Joe Glass (Butler) is on the hunt for a U.S. sub in distress when he uncovers a secret Russian coup threatening to dismantle the world order. With crew and country on the line, Captain Glass must now assemble an elite group of Navy SEALs to rescue the kidnapped Russian president and sneak through enemy waters to stop WWIII. This promotion will end Friday, February 1st at 12:00 PM (eastern time). Only one entry per person. No purchase necessary. U.S. residents are eligible to enter. Winners will be contacted via email. AccordingtoKristin.com and other promotional partners are not responsible for lost, stolen, or misdirected mail. SYNOPSIS: A group of friends are bound for a horror-themed Halloween event at a local amusement park — a sprawling labyrinth of rides, games, and mazes that travels the country and happens to be in town. But for one visitor, the ghoulish carnival of nightmares is not the attraction — it is a hunting ground. On the night the friends attend, a masked serial killer turns the amusement park into his own playground, terrorizing attendees while the rest of the patrons believe that it is all part of the show. As the body count and frenzied excitement of the crowd continues to rise, who will fight to survive the night? This promotion will end Friday, January 11 at 12:00 PM (eastern time). Only one entry per person. No purchase necessary. U.S. residents are eligible to enter. Winners will be contacted via email. AccordingtoKristin.com and other promotional partners are not responsible for lost, stolen, or misdirected mail. Enter to Win! | COMET & CHARGE! December Giveaway! The Terminator! Babylon 5 Christmas Marathon! Blair Witch! And More! December 19, 2018 December 19, 2018 by KristinLeave a Comment on Enter to Win! | COMET & CHARGE! December Giveaway! The Terminator! Babylon 5 Christmas Marathon! Blair Witch! And More! Yep, this December the sci-fi and horror classic The Terminator is blasting its way through Comet TV! Check out the classic and the birth of Cyberdyne Systems! If that wasn’t enough to celebrate the holiday season Babylon 5 has a Christmas marathon! After you sip your egg nog and trim the tree, turn on COMET TV for a spacey Christmas Marathon! Starting at 10a/9 C! And don’t forget to check out Area 10! The best in cult classic films are airing all month long on Comet TV! In celebration of the holidays, we have an awesome giveaway opportunity with exclusive swag for one awesome COMET TV viewer! This promotion will end Sunday, January 6 at 10:00 AM (eastern time). Each household is only eligible to win COMET TV + CHARGE! September Pack via blog reviews and giveaways. Only one entrant per mailing address per giveaway. If you have won the same prize on another blog, you will not be eligible to win it again. Winner is subject to eligibility verification. AccordingtoKristin.com and other promotional partners are not responsible for lost, stolen, or misdirected mail. 1 – Exclusive Blair Witch Holiday Ornament – Deck the halls and ring in the new year with the Blair Witch! This hand-crafted ornament will bring holiday scares to you and those you love! 1 – Terminator Dog Tag – John Connor is the leader of the resistance and this promo dog tag set will get you ready to battle the cyborgs of the future! 1 – Babylon 5 and Space:1999 Custom Snack Box – This is the perfect treat to celebrate any trip to space. It might require some popping, but this custom box will satisfy any spacey craving! 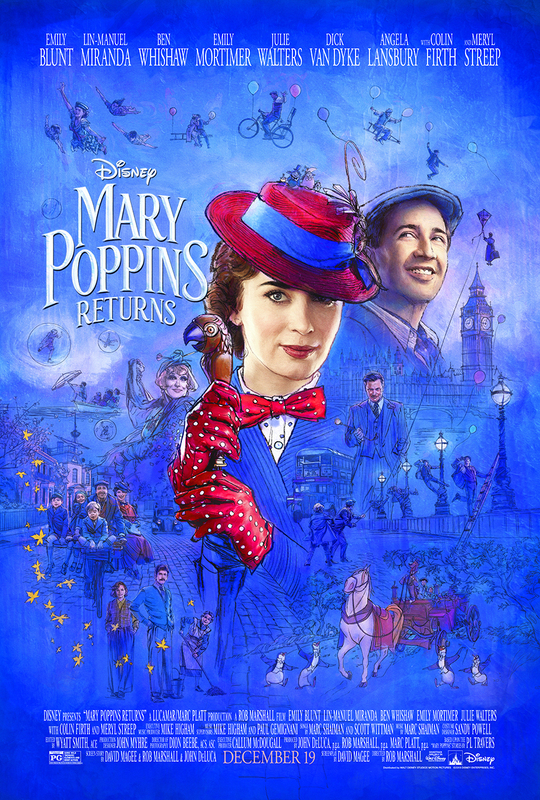 Here’s an opportunity to get advance screening passes for a highly anticipated sequel “Mary Poppins Returns,” out in theaters December 19. However, the subsequent adventures of Mary Poppins remained only on the pages of the seven other PL Travers’ books…until now. Available just in time for Halloween on Digital, Blu-ray™ & DVD now! This promotion will end TOMORROW, November 2 at 12:00 PM (eastern time). Only one entry per person. No purchase necessary. U.S. residents are eligible to enter. Winners will be contacted via email. AccordingtoKristin.com and other promotional partners are not responsible for lost, stolen, or misdirected mail. This promotion will end Tuesday, October 9 at 10:00 AM (eastern time). Only one entry per person. No purchase necessary. U.S. residents are eligible to enter. Winners will be contacted via email. AccordingtoKristin.com and other promotional partners are not responsible for lost, stolen, or misdirected mail. SYNOPSIS: In SICARIO: DAY OF THE SOLDADO, the series begins a new chapter. In the drug war, there are no rules – and as the cartels have begun trafficking terrorists across the US border, federal agent Matt Graver (Josh Brolin) calls on the mysterious Alejandro (Benicio Del Toro), whose family was murdered by a cartel kingpin, to escalate the war in nefarious ways. Alejandro kidnaps the kingpin’s daughter to inflame the conflict – but when the girl is seen as collateral damage, her fate will come between the two men as they question everything they are fighting for. Looking for a creative outlet? Try Skillshare Premium FREE for 2 months! August 1, 2018 August 1, 2018 by KristinLeave a Comment on Looking for a creative outlet? Try Skillshare Premium FREE for 2 months! If you’re looking to learn new ways to be creative, check out Skillshare! I discovered them through an account I follow on Instagram and I can’t wait to sign up for some classes. A few years ago, I went ahead and bought a Cricut machine with zero knowledge on how to use it. Unfortunately, we had a few deaths in the family and ended up moving, so I never had the chance to actually use the machine until now . . . and now I’m hooked. I’ve been a YouTube fanatic lately trying to find projects to make and how the heck to become a hand lettering pro. With Skillshare, now I can sign up for tutorials on how to master hand lettering on the iPad and how to get the most out of my Creative Cloud subscription. Check it out for yourself and see if there are classes geared towards your creative needs. Sign up for the premium membership and get 2 months free with my link below! This promotion will end June 15 at 10:00 AM (eastern time). Only one entry per person. No purchase necessary. U.S. residents are eligible to enter. Winners will be contacted via email. AccordingtoKristin.com and other promotional partners are not responsible for lost, stolen, or misdirected mail. To celebrate the release of this terrifying new film we have a Truth or Dare Challenge Blog App and a giveaway for you (**see below for info on how to enter**)! Play the game… If you dare! Grab a friend and take the Truth or Dare challenge to see who survives. Test your skills on the Truth or Dare Challenge Blog App below! 1 – Truth or Dare Official Promo Tank – Show off with this Truth or Dare Official Tank. Once you play the card game, the winner will get this tank to show off to all their friends! This promotion will end April 21 at 10:00 AM (eastern time). Only one entry per person. No purchase necessary. U.S. and Canada residents are eligible to enter. Winners will be contacted via email. AccordingtoKristin.com and other promotional partners are not responsible for lost, stolen, or misdirected mail. Click HERE to start the game!